The Chargers had a phenomenal regular season last year notching a league best 14 wins. But faltered in their first playoff game, a second round match up against the New England Patriots. The Bolts definitely have something to prove this season after their pre-mature exit from the playoffs last season. San Diego has one of the most talented rosters in the NFL entering the 07’ season. There are a few new faces in San Diego this year, but the roster remains pretty much intact. Norv Turner is now the man in charge after Marty Schottenheimer’s departure due to irresolvable personal conflict between he and general manager A.J. Smith. The good thing for the Chargers is that Head Coach Turner installed their offense when he was the Charger’s offensive coordinator in 01’. In terms of new players, the Chargers didn’t make any big moves in free agency in the off-season. But they did fill some needs in the draft. The Chargers’ first choice, WR Craig Davis (LSU), will play this season. His speed will definitely help spread defenses out and open up the middle for TE Antonio gates. Their second choice, SS Eric Weddle (Utah), will compete with Clinton Hart for the starting job at SS. If he wins the job or not, he will see playing time in the bolts’ defensive backfield. The Chargers selected ILB Anthony Waters (Clemson) in the third round. He will add depth to an inexperienced ILB position on the Chargers’ defense. The Chargers also selected a player in the supplemental draft. CB Paul Oliver (Georgia) will see some time this year as a nickel and dime defender but will prove more valuable next season after the probable departure of CB Drayton Florence. The biggest loss for the Chargers is ILB Donnie Edwards. Aside from his outstanding play on the football field, Edwards provided veteran leadership on the defense. ILB’s Matt Wilhelm and Stephen Cooper are expected to start for the Chargers. They both show potential but have seen limited playing time the last few seasons. The addition of rookie ILB Waters could prove to be a valuable one if Wilhelm and Cooper can’t carry the load. Veteran WR Keenan McCardell is no longer with team along with veteran ILB Randall Godfrey. The Chargers will have one of the most explosive offenses in the NFL this season. RB LaDainian Tomlinson is coming off the best season of his career. A season in which he won the MVP award and set the NFL record for single season touchdowns, single season rushing touchdowns and most points scored in a single season. The return of 2nd string RB Michael Turner is very important because it gives LT a break without giving the opposing defense a breather. Turner is a well-balanced runner who can take it the distance every time he touches it. Running behind FB Lorenzo Neal and an all-pro offensive line are yet another reason these two backs do so well. QB Philip Rivers proved last season that he was worthy of starting in the NFL. This year he is out to prove that he is not just worthy but that he is one of the elite passers in the league. Having the best RB and TE in football helps Rivers immensely. Defenses have to focus on stopping the Chargers daunted running attack and that leaves the window open for Rivers to pick apart secondaries. TE Antonio Gates is hands down the best TE in the NFL. Even with such large stature, he is extremely agile. He has great hands and can catch balls over defenders. Gates creates huge match up problems for defenses. Safeties are often too small and not strong enough to cover Gates but linebackers are not quick enough to stay with the all-pro TE. 2nd string TE Brandon Manumaleuna is a great compliment to Gates. He is much bigger than Gates and a better blocker. Manumaleuna is especially valuable in short yardage and goal line situations. He can block almost as well as most offensive tackles yet he is a threat to sneak through the line of scrimmage to catch a pass. WR Vincent Jackson is poised to have a break out season. He has all of the skills to be a premier WR in the NFL. Jackson has a large frame, quick feet and great hands. Rookie WR Craig Davis will most likely be the #2 receiver with WR Eric Parker scheduled to miss the first few weeks of the season with a toe injury. WR Malcom Floyd is another tall pass catcher on the San Diego roster. Many think the Chargers are weak at WR but they certainly are not. The receiving corps will prove this year that they are not the weak link. The O-Line in San Diego is one of the best in the NFL. Anchored from left to right by T Marcus McNeil, G Kris Dielman, C Nick Hardwick, G Mike Goff and T Shane Olivea. McNeil earned a trip to the pro-bowl last season along with earning numerous rookie distinctions. The Chargers are very luck that Dielman didn’t sign a more lucrative contract with a team like Seattle this off-season when he was an unrestricted free agent. Instead, the dominating guard chose to re-sign with the bolts and chase a championship. Hardwick was named to his first pro-bowl last season while paving the way for LT’s record-breaking year. Goff is definitely the leader of the bunch and is a big reason why this unit is so dominating. Olivea enters his fourth season in the NFL and his fourth season as a starting tackle for the Chargers. They are an intimidating bunch of guys who play with attitude. These guys win the battle up front week in and week out. They are equally dominant at pass blocking and run blocking and are key to the Chargers’ offensive success. It all starts up front and so do this: with the defensive line. The LB’s make the most noise in the press and statistics categories but they wouldn’t be able to if the D-Line didn’t own the line of scrimmage. The big man in the middle, Jamal Williams is the best nose tackle in a 3-4 defense in the NFL. He jams up the middle and makes great penetration even when he is double-teamed which is often. Williams was named to the pro-bowl last year and earned all-pro honors from the Associated Press. DE Luis Castillo enters his third season in the league. He owned right tackles last season. He squeezes gaps very well and is an important part of the Chargers daunting run defense. Castillo is also a force to be reckoned with coming off the edge as a pass rusher, his pass rushing ability makes it difficult for offenses to block him and the OLB blitzing off the edge. On the other side stands one of the strongest players in the entire NFL, DE Igor Olshansky. Olshansky a native of the Ukraine, enters his third year as a starter on the Chargers’ defense. He was hampered for much of last season with a knee injury but still managed to stifle defenses with his impressive blend of strength and agility. He is a fierce competitor who doesn’t take any @#%! from anyone, especially offensive linemen. The defensive line is pretty deep with DE Jacques Cesaire and DT Ryon Bingham. The Chargers have one of the best linebacking corps in the league. 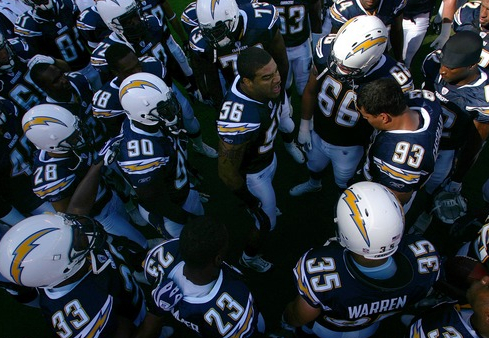 Led by Shawne Merriman they are poised to have another stellar year. Merriman led the league in Sacks last season despite being suspended for four games because of a substance abuse violation. He was named to his second straight pro-bowl last season and is recognized by many as the best LB in football. OLB Shuan Phillips stepped up big for the bolts’ D last year when Steve Foley was placed on IR. He was put in the starting role and the defense didn’t miss a beat. He tallied a career high 11.5 sacks on his way to earning a spot as a second-alternate on the AFC pro-bowl team. Teams are frequently forced to ignore Philips while they send everything but the kitchen sink to the other side to stop Merriman. He is a great young player who took advantage of an opportunity and never looked back. The inside linebacker position is a much different story for the Chargers this season. They have to make for the departure of Donnie Edwards and Randall Godfrey. ILB Stephen Cooper will start at on of the ILB positions while Matt Wilhelm will get the nod at the other. Cooper saw a decent bit of playing time last season totaling 82 tackles and 2.5 sacks. He has great athletic ability and if you combine that with the experience he gained last season it won’t be surprising if he plays well this year. Wilhelm didn’t see much action with the defense last season but he did on special teams totaling 15 tackles. The Chargers believe Wilhelm has a bright future in the NFL signing him to a five-year contract extension in December. Rookie Anthony Waters will add depth to LB position as he acclimates himself to the pro game. The DB’s of the Chargers definitely benefit from the pressure that the front seven puts on opposing quarterbacks. The leader of the secondary is starting FS Marlon McCree. Last season was his first with the bolts and he was a big reason the bolts improved to 13th against the pass as a defense from 28th the season before. SS Clinton Hart is penciled in as the starter but rookie SS Eric Weddle will compete for that roster spot. Hart comes off a season in which he set career highs for interceptions with three and special teams tackles with 22 (led team). Weddle leaves behind a successful career at Utah as he attempts to make his mark in the NFL. Even if Weddle doesn’t earn the starting job he will see time as nickel and dime back. The Chargers continue to improve at cornerback. CB Quentin Jammer is coming the best season of his career when he tallied a team leading and career high four interceptions. Jammer had been relatively disappointing to Charger fans the previous few season but he finally seems able to combine the mental part of the game with his superior physical attributes. Starting at the other CB position will be Drayton Florence. He posted a career high in tackles and passes defended as he made a name for himself as a shutdown corner in the NFL. CB Antonio Cromartie enters his second season with bolts and will see significant playing time in the defensive backfield. He is rather large for a corner but possesses game breaking speed. The Chargers added depth to the CB position in this years supplemental draft selecting CB Paul Oliver form Georgia. Oliver was projected as an early first round draft choice in next years draft but was deemed academically ineligible to play his final season in college. He is a talented player who will also see some time in nickel and dime packages. K Nate Kaeding was selected to his first pro-bowl last season and is already regarded as one of the best kickers in team history. He was 26 of 28 for field goals last season and hit every extra point. He showed off his strong leg last season kicking a 54-yard field goal at Baltimore last season. P Mike Scifres emerged as one of the elite punters in the NFL last season on a spot on the AFC pro-bowl squad as a second-alternate. He averaged 41.9 yards a punt last season while setting a team record for punts inside the 20 with 35 and only two touchbacks. LS David Binn has made a sweet living for himself as the Chargers’ long snapper since 1994. He set a team record last year for most games played as a Charger. Binn is the only player still on the roster form the Charger squad that went to the Super Bowl in the 94’ season. As if living in San Diego and snapping balls for a living wasn’t enough for Binn there have been rumors that he is/was romantically involved with Pamela Anderson. The Chargers have a solid return game led by RB Michael Turner who gained 854 yards on 36 returns to average 26.5. His counterpart in the kick return game last season was CB Antonio Cromartie returned 11 kicks for 304 yards averaging 27.6 yards per return. WR Eric Parker did a majority of the punt returning last season but will be sidelined with a toe injury for the first few weeks of the season. Darren Sproles is listed as his back-up and will probably return punts until Parker’s return. Veteran WR Keenan McCardell will be missed in this position as he would return punts that were kicked deep inside Charger territory. With a roster as impressive as this, San Diego fans are thinking Super Bowl this year, and they should be. The Chargers do have their work cut out for them though with a pretty tough regular season schedule. The Chargers will host the Bears in week 1, play at the Patriots in week 2 and take on the Colts in San Diego in week 9. 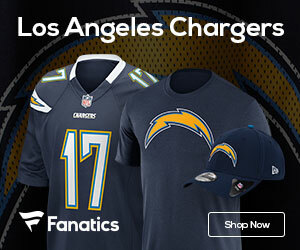 The Chargers are definitely favorites to win the AFC West this season and they should be able to pick up some cheap wins over the Raiders and Chiefs. The Chargers learned last year that the best regular season record in the NFL doesn’t mean anything if you don’t win in the post-season. There will definitely be disappointment in San Diego if the Chargers don’t make a deep run into the playoffs this year.